Talking about toilets is sometimes awkward. But if talking about these unsanitary facilities or looking at photos of them is uncomfortable, what is is like to actually have to use them? The children at the Twiga School in Ruriru District, Kenya have deplorable toilet facilities. To call it "sanitation" is simply not appropriate. There are 500 kids attending the school and the photo here shows how disgusting the toilets are. In 2012 at a similar school in the same district, CanAssist funded construction of latrines and washing areas that greatly improved the sanitation at Mutundu School. Our goal in the next few months is to provide toilets like these for the students and staff at Twiga School as well. The cost to do this is about $6000. We thank the Grey Gates foundation of British Colombia for a promise of $3000 to put toward this project. 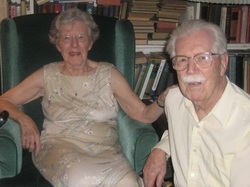 The family of Ruth and Donald Redmond would like to honour them on the occasion of their 65th wedding anniversary in August. Friends and family are invited to participate by donating to CanAssist in support of the Twiga School Sanitation project. CanAssist congratulates this couple on this remarkable achievement and thanks them for supporting the Twiga School through CanAssist in this way. or when you use the link to Canada Helps, below, to make your contribution online.